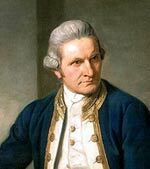 Captain James Cook ( 1728 – 1779) was a British explorer who made groundbreaking voyages to the Pacific Ocean. He made the first European contact with the Eastern coast of Australia, and he chartered several islands in the Pacific. Born in the tiny village of Great Ayton, Yorkshire in 1755, Captain James Cook went on to become one of the most famous sea explorers of his age. He helped to find new lands and redraw the maps of the time. He was born into a poor labouring family. He gained some schooling up to the age of 12, showing an aptitude for maths, but at the age of 12, economic necessity meant he had to go and help his father working in the fields. After five years working as an agricultural labourer, he gained employment in a nearby fishing village of Staithes. Here, he worked as a shop boy for William Sanderson, a local grocer. After working for a year as a grocer, James Cook gained an apprentice for a Quaker-owned shipping company. It was here that James Cook began learning the arts of navigation and seamanship. In 1755, he decided to try his luck in joining the Royal Navy. At the time, standards in the Royal Navy were very low. They were characterised by violent treatment of the men, and low standards of nutrition and health. Death rates amongst sailors was high. This was something that Captain Cook sought to change. When he gained his commission to captain a ship, he maintained goods standards of cleanliness and had exceptionally low rates of disease such as scurvy. He attributed this to his strict regime of cleanliness and sauerkraut. During the late eighteenth century, there was great interest in surveying unknown lands. After serving in the seven-year war with France, he was commissioned in 1768 by the Royal Society on a scientific expedition to the Pacific. This was the start of his travels around the oceans of the world. He helped to chart the coasts of New Zealand and Australia. He visited many unknown islands – witnessing human sacrifices in Tahiti amongst other things. He was appointed to Commander and met King George III. He later went on to navigate around Antarctica and the Northwest Passage between Russia and Alaska. 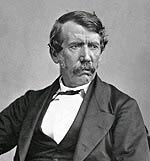 He was killed by natives in Hawaii over a dispute over a stolen boat. This death was ironic because he sought to maintain good relations with natives. He was an explorer of tremendous determination and faith. He helped spread the boundaries of known sea travel and raised standards for the welfare of his men serving under him. Citation: Pettinger, Tejvan. “Biography of Captain Cook”, Oxford, www.biographyonline.net, 18th May 2011. Last updated 19 February 2018. 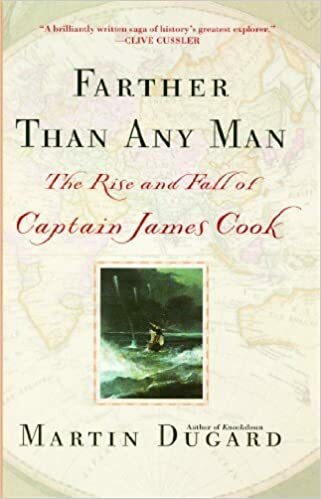 The Rise and Fall of Captain Cook at Amazon. Famous adventurers and explorers – Famous adventurers and explorers, including: Christopher Colombus, Marco Polo, Roald Amundsen and Neil Armstrong.